1. People who intentionally say/write their gratitude weekly are found to be more physically healthy and feel more optimism about the upcoming week than those who lean their focus on their stressors and neutral weekly events. 2. Discussing your thankfulness daily leads to better determination, attentiveness, energy and sleep (I am sure we can all use better sleep in the fall)! 3. Grateful people also report lower stress and depression levels – without ignoring the bad. 4. Daily gratitude also leads to being more helpful and supportive of others and their problems. 5. And it leads to a healthier mind, with less judging and envy and more sharing. 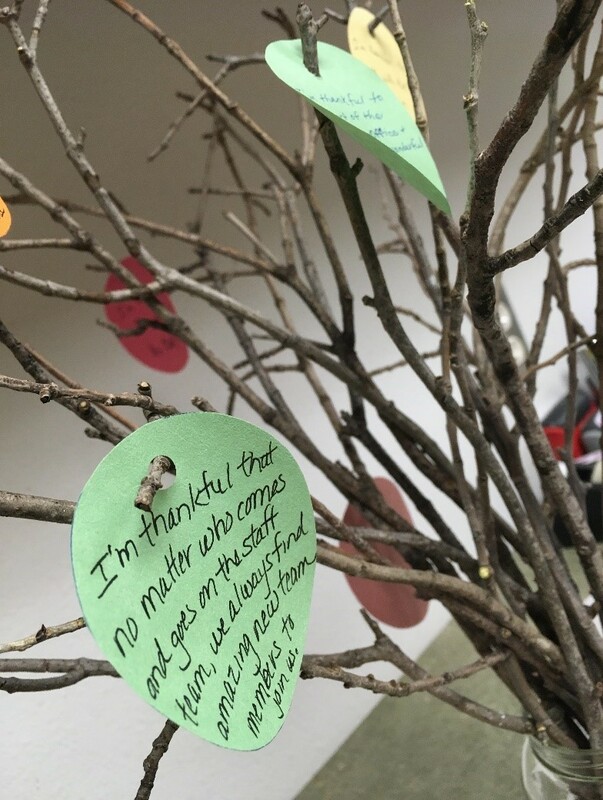 Start a Thankful Tree (or similar program). 1. Place a jar of sticks (fancy or not, you get the jist) in a central location. Place blank leaves or pieces of paper next to it and encourage people to write things they are thankful for in your office. 2. Tape blank leaves or paper to your staff’s doors and encourage your team to write things they are thankful for about each employee as the month progresses. 3. Do a shout-out or snaps session at your next meeting and allow people to share their own accomplishments or something a co-worker has recently done well. Giving thanks can have a negative effect – if you leave people out. Make it your mission this month to support someone who lurks in the shadows, does not easily speak up or is not regularly praised. You never know what potential could be unveiled with a little extra encouragement and support!